It seems that most people fall into one of two categories: Disney lover, or Disney hater. I happen to love Disney. It had only been a year and a half since our family took a vacation to Disney World in Orlando. 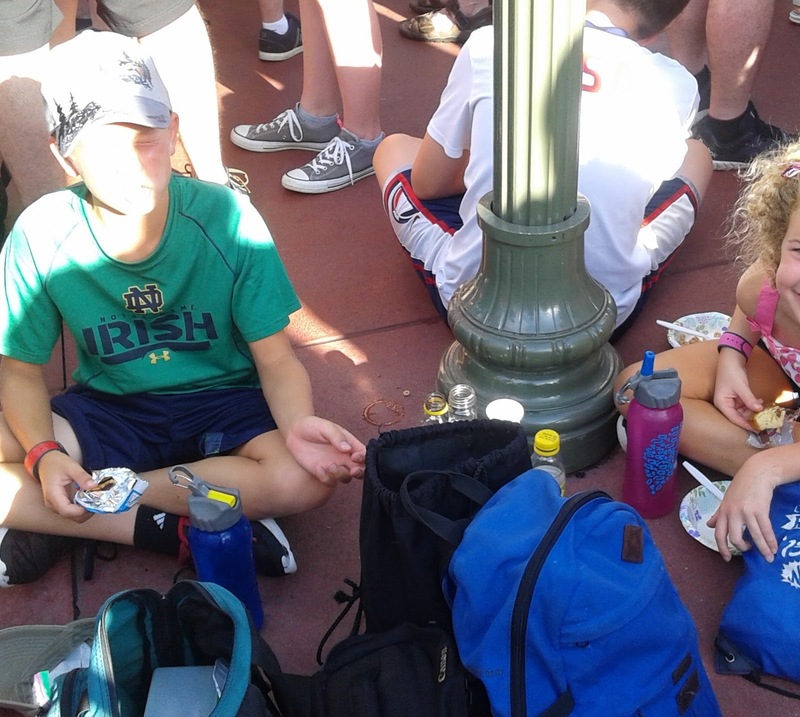 When the Irish dancing National Championships landed us back in Orlando over July 4th weekend, I couldn't resist stopping at the parks for a few days of fun. Only Curly was actually competing, but I invited Tetenka, Mini, and Reggie along for kicks. Coach frowned upon my generosity. After surviving a particularly trying Irish dancing experience in the fall, I countered that my plan was to turn this Irish dancing event into a positive experience. No matter what. Besides, just because the older kids of the family no longer qualify for expensive Disney tickets doesn't mean that the younger kids shouldn't be treated to a bit more Disney fun. Coach was quick to share that his willingness to participate in awesome Disney days expired after our last visit. Curly is only eight, so if her devoted Irish dancing career causes us to end up down the street I feel like squeaking out a little more magic for her. The siblings were entitled to jump in and join us because together they create lasting memories. I reserved a hotel room near the convention center that was hosting the dancing competition, and chose to stay there for all four nights of our trip rather than switch to a Disney property once Curly was done competing. Since our rate was $150 a night, I couldn't justify an additional $300 a night to be on Disney property. Our hotel boasted a free shuttle to Disney parks and a twisty slide in the enormous pool. Done. I began mapping out other ways to save money a few weeks before our trip. I organized two boxes of food and shipped it to the hotel in advance of our arrival. Boxing up granola bars, cereal, cookies, crackers, rice krispie treats, apple juice, granola, peanut butter, applesauce, trail mix, flavored popcorn, paper bowls, cans of mandarin oranges, plastic ware, and protein bars would make preparing breakfast, lunch, and snacks fast and affordable. I limited the kids in the amount of clothes they could pack to allow space in our luggage for a soft sided portable cooler. I froze enough of my homemade Sloppy Joe's to feed us two dinners. 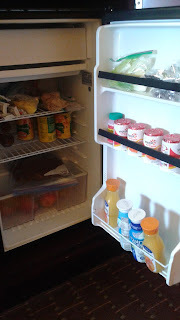 Yogurt, cheese sticks, lunch meat, small milk and orange juice containers, Molly's prescription amoxicillin, and four apples were shoved into the cooler in the bag that we planned to check. Bread and buns placed carefully in Tupperware containers to avoid being smashed rounded out my strategic menu packing plan. The size of the in-room fridge delighted me. Once our groceries were loaded, it looked like we were ready to stay for a week. After the cold food was unpacked, I realized that I had failed to inquire about the shipped boxes during check-in. A few days prior, I had confirmed that the boxes had arrived by using the tracking numbers. When I called the front desk to ask where I could find my special deliveries, I was told that the package room was closed on Sunday. I suffered a mini panic attack realizing that the next day was July 4th. If the package room was closed on a Sunday, then surely it wouldn't be open on a holiday. Suddenly my hunger pains increased. I played my celiac disease card and informed the hotel employee that I needed my boxes as soon as possible because of my diet restrictions. Besides, I pointed out, when I asked the staff if it was OK for me to ship boxes to the hotel in advance of my stay no one mentioned that I wouldn't be able to access the deliveries if I arrived on a Sunday. The employee assured me that when the front desk wasn't so busy they would find someone to open the package room. We ate an early dinner of Sloppy Joe's since our snack stash was still not on hand. After a few more 'where are my boxes' phone calls, we hung out at the pool for a few hours. Before heading back to the room, I stopped by the front desk. No one knew anything about my boxes. One of the bell hops agreed to take me personally to the package room. We drove there in a hotel minivan, and I grabbed my boxes. Tetenka and Reggie had accompanied me in order to help me haul the loot back up to our room. I feared that my boys constant need to eat would lead to them ripping open the boxes before we had gotten out of the minivan. At last our dry food stores joined our cold groceries, and we scarfed down snacks while kids rotated in and out of the shower in preparation for bed. I packed enough snacks to get us through our day of dancing. The boys whined incessantly begging for the dancing portion of the trip to be complete. I reminded them that since dancing was the reason for our journey to begin with, they should zip their mouths and support their sister. On one of his tours of the enormous convention center and hotel, Tetenka stumbled upon a spot where they were handing out free Popsicles to celebrate the 4th. He and Reg circled back a few times to scam additional frozen treats from the employees. Tetenka decided that after each shift a fresh, clueless employee would surface and if they played their cards right no one would realize they had already scored a free treat. So proud. With dancing behind us, we anxiously shifted our focus to our Disney adventure. I loaded the small, insulated lunch box with sandwiches and cheese sticks, milk and juice. Other draw string bags held our apples, banana, bowls, spoons, empty water bottles for sharing drinks, and dry snacks galore. We arrived at the Magic Kingdom almost an hour early. We staked out a spot on the pavement where I laid out bowls, offered the two varieties of cereal, poured juices, and dug out plastic spoons. Just before I poured the milk a man standing in front of us with his family turned and observed us. He stood dumbfounded until he finally said, 'I feel like I need to take a video of this and post it to YouTube as a 'How To' movie. This takes organization and dedication.' Although I was moving at a hectic pace to ensure the kids had time to finish their breakfast before the park opened, I acknowledged his compliment with a broad smile and a small chuckle. I pointed to the bags and explained that I had lunch packed as well. I told him I would have packed him a sandwich if only I knew what he preferred. If he had only seen what lengths I went to to claim my box of food back at the hotel. I shared with him that as a mother of six, I had developed many ways to save money when it came time to feed my clan while traveling. I told him about the crock pot dinners we feasted on last month at Glacier National Park, and the Sloppy Joe's that sustained us for the last two nights in Orlando. My kids ate their breakfast looking less than impressed with their budget conscious mom. Because they are always envious of the families who enjoy meals at restaurants, they failed to appreciate the man's round of applause directed at us while I was clearing the disposable breakfast dishes and packing up any remaining food. I reminded them that large families don't usually find extra dough in their budget to afford a visit to Disney World in the first place.